Rude blamed, in part, the city’s growing gap between income and home prices. 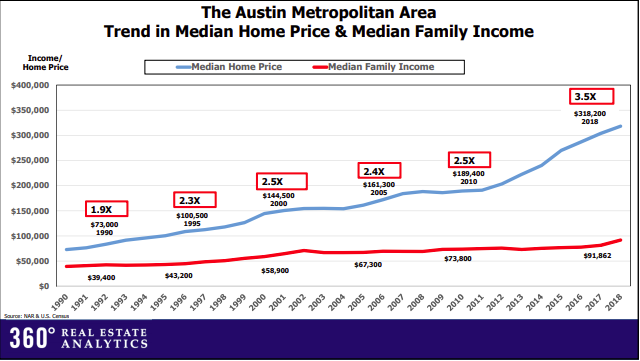 According to census numbers, the median-family income in the Austin metro area is $91,862, while home prices for the area are 3.5 times higher. That’s a higher disparity than in years before, Rude said. He cautioned that this widening could upset Austin’s ability to endure a future recession. “Those cities that have the biggest disparity between income and home prices during recessionary periods are most likely to lose value in terms of home prices,” Rude said. Rude said the Austin housing market had a strong start in 2018, but slowed at the end of the year. 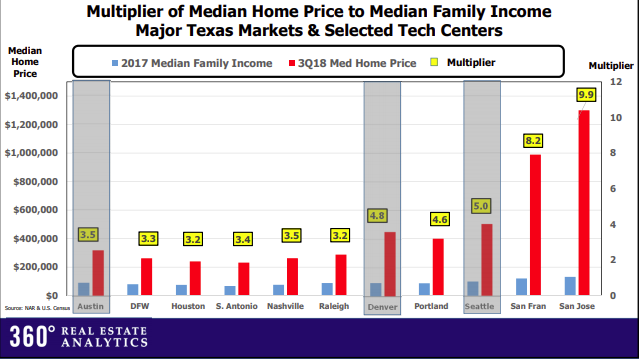 This graph shows the median home price in Central Texas is 3.5 times the median income. But given all that, Rude said, the demand for housing in Austin remains strong as more employers move here. In December, Apple announced it would build an office on the edge of the city, making Austin the second-largest home to Apple employees.